PhD research on urine sample collection wins Best Poster Prize at national conference. 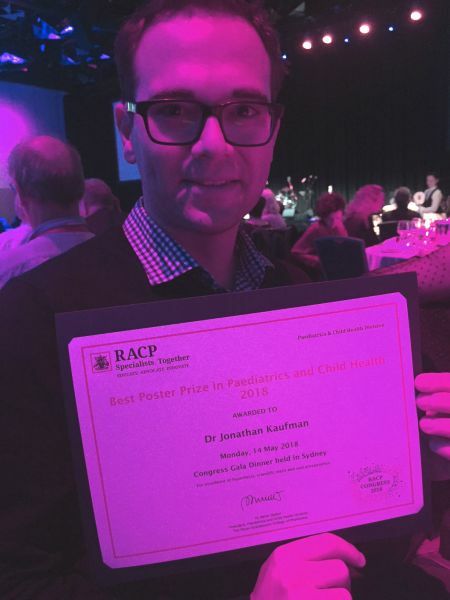 Dr. Jonathan Kaufman (Paediatrician PhD student) received the Best Poster Prize in Paediatrics at the RACP Congress in Sydney this month, for his “Liquid Gold’ Health Economic Analysis. The study investigated the cost-effectiveness of urine collection methods used for young children with urinary tract infections, a common problem in general practice. Jonathan’s PhD is supervised by Professor Meredith Temple-Smith and Associate Professor Lena Sanci.